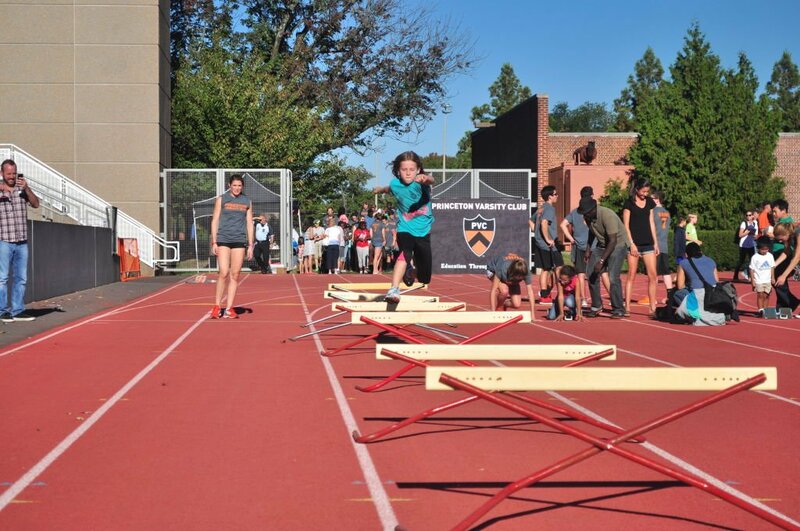 It was last spring when the Princeton Varsity Club took a bus of student-athletes to Rosedale Park in Pennington, New Jersey for the sixth annual Weapons of Mass Construction (WOMC). For the Fall 2014 WOMC event the roles were reversed, as the PVC partnered with the Office of Community and Regional Affairs to serve as host to the HomeFront Organization for the annual Community and Staff Day event held on the Weaver Track open field Saturday September 27th, 2014. While the weather was unusually warm, there was nothing unusual about the warm welcome received by the children from HomeFront as they stepped foot on campus. Over twenty enthused Princeton student-athletes marched over to meet the bus of thirty children and lead them to Weaver Track for fun and games. 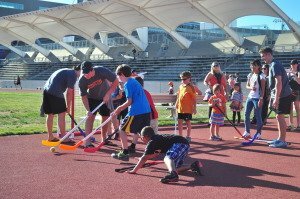 Children of all ages from the greater Princeton community populated the track to make a family-friendly environment prior to the Princeton football team’s home-opening game against Davidson. Over 150 Princeton student-athletes manned the youth sports clinic with several outdoor activities. 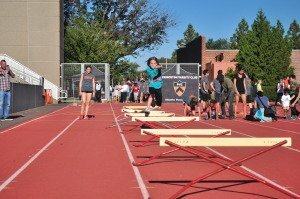 These stations included football, basketball, baseball and track, street ho ckey competitions and lacrosse activities, rowing machinery, and a crowd-favorite arts and craft station. Through the WOMC service initiative, the Princeton Varsity Club was excited to partner with several campus partners to provide an opportunity for young children to visit the beautiful Princeton campus, while also allowing them to engage and interact with our student-athletes who serve as terrific role models. The Community Staff Day event also served as a tremendous tool in strengthening the bonds between our dedicated student-athletes and the greater Princeton community. Following the outdoor activities, children from the HomeFront organization enjoyed a pizza party with the men’s ice hockey team leading up to free tickets to the football game and the Princeton victory—certainly a fitting close to a fun and exciting day for the kids, student-athletes, and the greater Princeton community as a whole. Community & Staff Day is co-sponsored by the Office of Community & Regional Affairs, the Department of Athletics, the Office of Human Resources and Princeton University Dining Services.